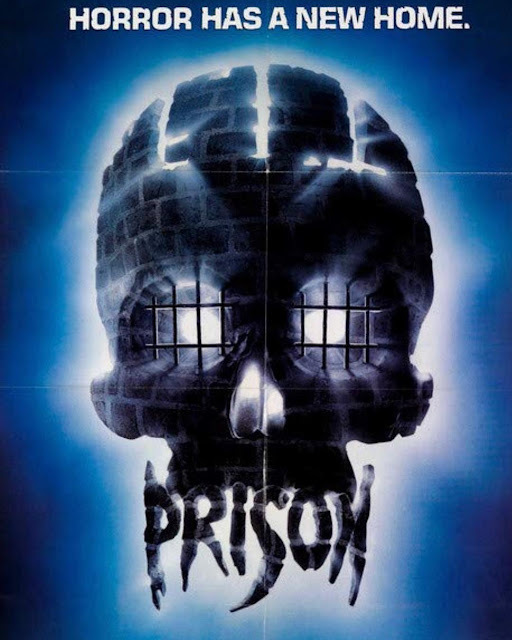 An 80's supernatural Horror film set in a prison? Count me in! Admittedly this was one of those films that passed me by, I'd seen the poster, I'd heard people talk about it, but for some reason I just never sat down and actually watched it. I decided that it was now or never and forced myself to finally watch the film, it may sound strange but it can be easier said than done. I'm actually quite surprised I haven't watched this as I'm a fan of both supernatural and prison set films, with this being the two put together it only seems natural I'd have seen this a long time ago. I was actually really excited to watch it, I do love that buzz you get of finally watching a film you've wanted to see for a while. The film stars a very young Viggo Mortensen who shows through his early potential why he went on to become the star he is today, we also see Lane Smith who puts in one heck of a performance as the warden. The film also features some very fun gore sequences that will please any fan, plus some surprisingly really well done stunts. The film is Directed by Renny Harlin who does an astounding job with what he was given, it's no surprise he went on to have a great career with getting to direct the likes of "Elm Street 4", "Die Hard 2" and "Cliffhanger". If it wasn't released around the same time as films such as "Destroyer" and "Shocker" I'm sure it would've been a bigger hit. "Prison" is a true 80's gem, sure it hasn't exactly aged well but it's still got a cracking story with some great acting. If you've not watched it yet don't put it off any longer like I did, if you have seen it then I suggest you go back and give it another viewing. The electric chair (which was never used in Wyoming) was built into the actual gas chamber of the Wyoming Prison and the death scenes were filmed there. 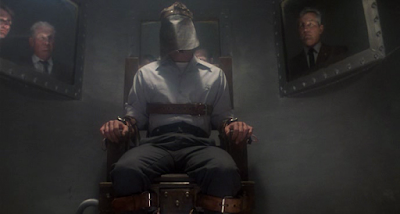 The original chair, was carefully removed and an electric chair was built in its place. During the shooting, Viggo Mortensen's convulsions were so violent the arms of the chair were broken and needed to be repaired. A special set of sledge hammers had to be purchased for actor "Tiny" Lister so that they did not appear to be "toys" when he held them. His sledge hammers weighed 18 lbs, and one was a 20 lb hammer. Director Renny Harlin was living out of his car when he was first approached to direct this film. Chelsea Field was supposed to do a scene in a bathtub, but refused to do it. Renny Harlin drew all the storyboards for this film. The water that Viggo Mortensen runs through in his underwear was real. That part of the prison had been flooded for years, the temperature in the room was below 50F and the water temperature was 46F. Mortensen's shivering is real. He insisted on shooting the scenes without a double, and only at being forced to relented for some close up scenes. The "gate" for the entrance to the prison does not exist. It was built onto a back wall section of the prison. In the process of cutting a hole in the wall for vehicles, the wall, constructed by prison labor, it was discovered, had many odd items in it as filler including a snow plow. Filmed in 1986 but not released until 1988 due to Empire Pictures bankruptcy. Over eighty actors auditioned for the role of Burke. Viggo Mortensen did the bulk of his own stunts. Moreover, stunt coordinator Kane Hodder gave Mortensen an honorary stuntman's shirt at the completion of the shooting for this film. The high altitude sun in Wyoming caused shooting issues in the scene where the prisoners are stripped to their underwear and forced to stand outside all day. Due to technical issues, the scene was shot over and over and the prisoners in the background become sunburned on one side of their bodies only as extras were not provided sunblock. 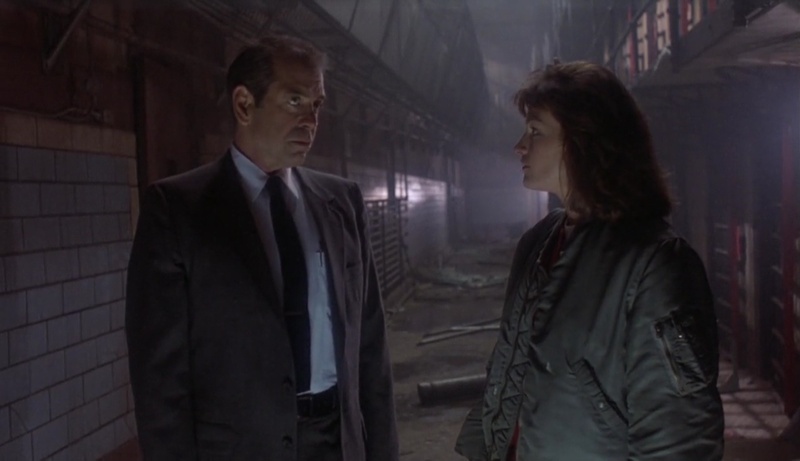 The posters on some of the prison cells, are from movies made by Irwin Yablans, Charles Band, and in one case - Linda Blair, that poster is really autographed by her, as she was on set from time to time visiting a friend who worked on the crew. Mickey Yablans, who plays Brian, is the son of producer Irwin Yablans. The Warden's office set was built with windows from the real warden's office which could not be used, ironically, because of a hole in the floor. Producer Irwin Yablans initially conceived this film as a slasher movie. Screenwriter C. Courtney Joyner came up with the idea to make the premise a ghost story instead. The old Wyoming State penitentiary was closed just a few years before the movie was filmed, the last inmates left in 1981 after 80 years of use. Coincidentally, director Renny Harlin's father once worked as a prison doctor during Harlin's childhood. In one scene, the character of Lasagna is hanging a poster for the second Rambo movie in his jail cell. Director Renny Harlin later went on to work with Rambo himself, Sylvester Stallone in Cliffhanger and Driven. Chelsea Field did most of her car stunts during the climax of the movie. Chelsea Field visited a penitentiary to research her character. Viggo Mortensen and Tom Everett both appear in Leatherface: Texas Chainsaw Massacre III (1990). Part of a cycle of horror films about murderers coming back from the dead after execution in the electric chair. Destroyer (1988), The Horror Show (1989), and Shocker (1989) were also included in this trend. Composer Ken Harrison did a score which was not used.